Eyecare professionals throughout Canada are now able to present Transitions® Signature™ VII Graphite Green lenses to all their customers. Those everyday lenses combine all the benefits of the latest generation of Transitions lenses that react better to indirect light and become darker than ever in higher temperatures, with a gray-green tint that provides truer perception of colours and a fashionable look. 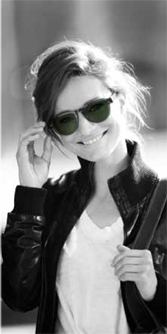 ECPs and their customers might recognize the iconic green colour of the lens, as it dates back to the 1950s when the tint was applied to sunglasses worn by U.S. Navy pilots. The gray-green hue was originally developed based on research that showed how human eyes respond differently to various colours in the visual spectrum. The gray-green lenses were then formulated to emphasize certain colours to help pilots locate and track objects against a variety of outdoor backgrounds such as earth, sky and water. Aware of the importance of maintaining good visual health, Laurence Leboeuf has agreed to join the Canadian campaign to launch Essilor’s Transitions® Signature™ Graphite Green lenses. She perfectly represents the target market for these new corrective lenses: young, trendy adults, always on the move and enjoying the glamorous side of life. Laurence started her TV career at 11 in the television series Virginie. After she learned English in 2004, she was cast in 15/Love and won a Gemini Award for Best Supporting Actress for that role. Laurence has been actively working in both languages and receiving critical acclaim ever since. She was most recently seen in the TV series Trauma (in French) and 19-2 (in English).